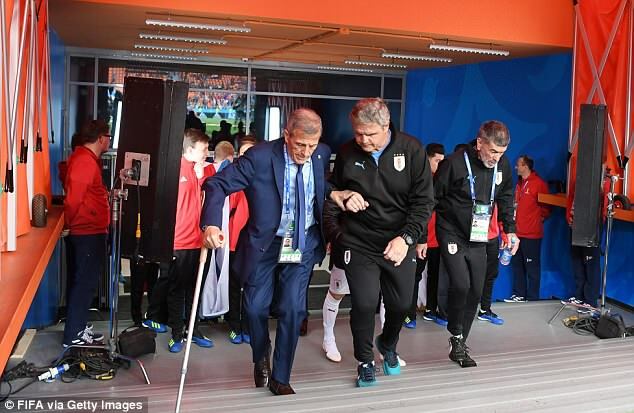 As the game between Egypt and Uruguay was about to kick-off, Coach Oscar Tabarez was being helped to the dug-out, using a crutch and the hand of an assistant to scale the steps of the Ekaterinburg Arena on Friday. The 71-year-old, who has been in charge of the national team since 2006, is managing in his third World Cup with Uruguay. But as his side battle to reach the knockout stages and continue their impressive recent record in major tournaments, the coach has another fight on his hands. 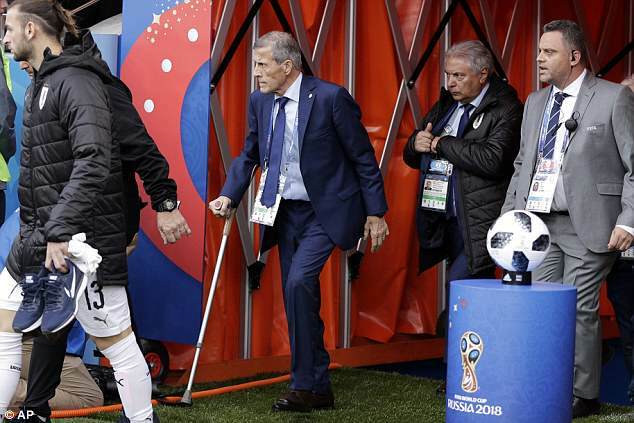 Tabarez suffers from Guillain-Barre syndrome, a rare and degenerative disease that attacks the body's nervous system and causes muscular weaknesses in the limbs and chest. It can eventually cause paralysis. The manager was diagnosed with the serious condition in 2016 and was expected to leave his post for the sake of his health. At the time, he required a walking stick and electric wheelchair but vowed to carry on working. 'I am not living with any pain. This neuropathy sometimes causes me problems, especially to walk. But since this is a chronic illness, sometimes I am a little better,' he said at the time. His condition improved somewhat in the lead up to the showpiece in Russia but he still needs crutches and those around him to help his ailing body cope with the demands of international management. On Friday in Yekaterinburg, he had to be helped by a member of his backroom staff to his seat, where he watched his side begin their Group A campaign in Russia. Tabarez took Uruguay to the semi-finals in 2010, thanks in no small part to Luis Suarez's 'save' in the quarter-final against Ghana. They were knocked out at the last-16 stage four years later but in Russia, they are tipped to go deep into the tournament once more. Their veteran coach is nicknamed 'El Maestro' (The Teacher) because he used to work at a school and has improved the side's disciplinary problems. On the field on Friday, however, his side labored against their unfancied opponents – who were without Mo Salah from the start.